We’d love your help. 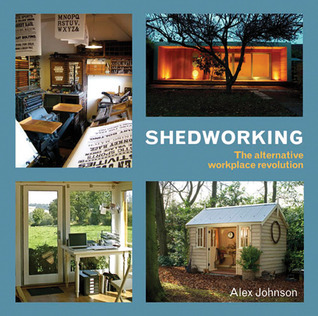 Let us know what’s wrong with this preview of Shedworking by Alex Johnson. To ask other readers questions about Shedworking, please sign up. I am a professional blogger and journalist, part of The Independent newspaper's online team in the UK. I run Shedworking (www.shedworking.co.uk) which inspired the book 'Shedworking: The Alternative Workplace Revolution' published by Frances Lincoln, The Micro Life (www.themicrolife.co.uk), and curate Bookshelf (www.onthebookshelf.co.uk), which was published as a book in 2012 by Thames & Hudso I am a professional blogger and journalist, part of The Independent newspaper's online team in the UK. I run Shedworking (www.shedworking.co.uk) which inspired the book 'Shedworking: The Alternative Workplace Revolution' published by Frances Lincoln, The Micro Life (www.themicrolife.co.uk), and curate Bookshelf (www.onthebookshelf.co.uk), which was published as a book in 2012 by Thames & Hudson as 'Bookshelf'.